Write about how your wishes change with the years. Do you think living is wishing? To wish is to hope? Expand. The path of the righteous man is beset on all sides by the inequities of the selfish and the tyranny of evil men. Blessed is he who, in the name of charity and good will, shepherds the weak through the valley of the darkness, for he is truly his brother’s keeper and the finder of lost children. And I will strike down upon thee with great vengeance and furious anger those who attempt to poison and destroy My brothers. And you will know I am the Lord when I lay My vengeance upon you. Finally, I whipped out my Star Wars Jedi light-saber (the one that lights up and makes a loud humming noise), leaped into the startled crowd, and started smiting left and right. It was fun! I was only five when my paternal grandpa passed away. His death was the first human death I encountered. Before that I mostly experienced the smell of death and a few times its ungainly sight on animals—of dead mice when the cats left them decapitated behind some cupboards or inside closets, of the cat itself, one of the strays who roamed the rooftop and screamed morbidly many nights. My maids said that some toms were having cats and no one could ever catch them at the act. I vaguely understood that some cats eat fellow cats besides mice, rats, birds, and lizards. The stench was horrendous. Then they found him, her, waterlogged and thrice its normal size, after it had been down to the bottom of the cistern as tall as the wall that supported the kitchen roof and up again, floating on the surface of the water that my father pumped up daily from our own well. It was years ago. I remember the sound of the pump going like I remember the cats’ fighting sound, their nightly screams, the chirping of mice behind some holes and their footsteps running on tiles. I cannot erase the smell of death from my memory. The violent fragrance of the white tuberoses, the brown tea leaves that covered Grandpa’s dead body so he would not smell—I remember them all. 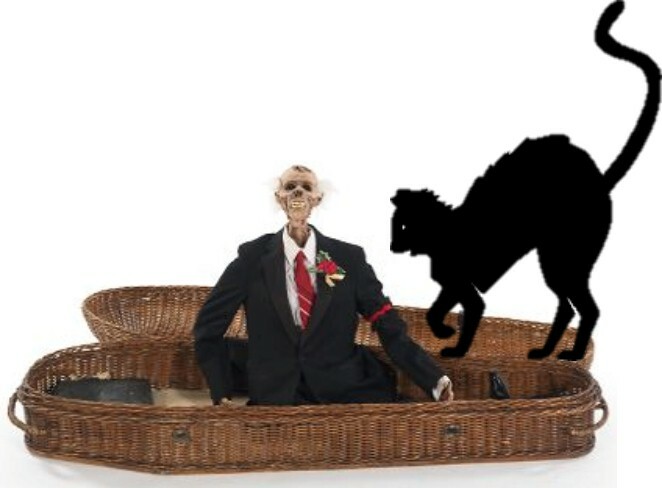 For three days he lay in that coffin, and someone was always present so that no black cat would jump over him. Or else he would rise with the cat. On the third day I was walking down the stairs of Grandparents’ house with my cousin when we heard a hammering sound. We both froze. It was getting dark outside and shadows dance inside the stairwell. On one wall was a deer head with two marble eyes. Next to it was a large painting of the last supper. My cousin flopped down on the stair step, pulling me after her. My cousin covered both her ears and started howling. And I did the same, trying to block out Grandpa’s rapping on the wood of his coffin. Combined in force, our scream might have risen above the loud knocking and drowned them out. Or they stopped. To me, the sudden ceasing of the hammering sound was even more terrifying than their loud knocking. It meant only one thing: Grandpa was done fighting with the lid that held him inside. He had freed himself from the container. And he was about to come after two little girls. My hysterical howling surpassed my shyer cousin’s. I screamed now for my life with all my might. Ah, ah…tongue knocking against teeth, teeth chattering inside skull, eyes closed to avoid seeing Grandpa walking up to us. No, it wasn’t Grandpa, we were told. The undertakers were the ones’ hammering. They were nailing shut the coffin to take Grandpa to his final rest. Categories: Monthly Theme, Uncategorized | Permalink. Just now Marilyn Jensen sends in an article for the administrator of Wittier Word Weavers to post for her. Who is Marilyn Jensen? She was a long-time member and many-time board member of the Writers’ Club of Whittier (the mighty WCW). Marilyn was WCW’s Member-at-Large in 2014, her last position with the club before she passed away in October of that year. It has been already a year and Marilyn seems to know that. She also knows that our club is now blogging, and it seems that she doesn’t like to be left out of the new activity. The best she can do from where she resides is these three pages she wrote for a Police magazine in April 1984. You can find the still very-active magazine by following this link http://www.policemag.com/magazine/1984/04.aspx. This article, “Winchester Mystery House” that we take the liberty to include here on our blog was published and archived in the April 1984 issue. Marilyn wants to. If WWW violates any copyright law, so be it. Marilyn wants to contribute, and considering the difficulty of sending something legible down to us that was instantly thought-formed in invisible ink, a far more advance technology than what we can dream of here below, recycling an article long-forgotten may be best means Marilyn can think of. Catch Marilyn if you can, Officer!